Thus the day of the traverse had arrived and everything looked perfect. We had arrived late on Friday the 1st of June at Port na long at the Skywalker bunkhouse. When I arrived at 9.30pm Derek and Arnie were already there. Ross and Kevin were not far behind, as was Duncan. However Duncan to get lost and took some 1.30 hours later . The plan was to meet Mike, our guide for the 5 days on the Saturday morning at Sligachan car park. The forecast for the weekend was for a weather front to move across Britain from west to east, however the speed and exact position was unknown and the forecast for the Monday and Tuesday was certainly better than for the weekend. We met Mike and went for some coffees at the Slig, and it became evident that we would not be attempting the Clach Glas traverse on the Saturday which had been suggested. This was because the weather was looking bad. We decided that we would trek up to the possible bivvy site at the Bealach Coire na Banachdich. This was directy past the Inn Pin. We left the car at the Mountain hut and having reached the bivvy site , the weather changed with torrential rain and squally winds leaving us all miserable and thoroughly soaked through!! After that we had a fair few drinks at the old inn before going to the Kyle of Lochalsh for a craggin session on the Sunday. This was fun although it was slightly damp. However unlike the Sat there were no winds which means only one thing in Skye – MIDGES! These were awful, even myself Ross and Kev had nets on and they still managed to bit through in the areas where the helmet kept the net near the face, I had a line of bites right across my forehead. Having spoken with Mike and Andy ~~(our two guide - there were to be two parties of three) that the weather was looking favourable and we would get a boat from Elgol across to the base of Gars Bheinn. The plan was to meet at Broadford at 6.30. This meant a 5.15 start although I surfaced at 5. We made it to Elgol for the 7.30 boat across to Eilean Reamhar. The wather was fantastic with blue skies and no clouds, this was better than forecast and increased everyones mood. The view to the Cuillin from here was very spectacular. The journey across took around 25 mins and before we knew it we were standing at the base of Gars-bheinn. We were standing on the summit before 10am having set off at 8.30 am. The group was in two groups with Kev, Ross and myself climbing with Mike and the Henderson contigent climbing with Andy . The range stood before us now and from my memory, a lot of the middle section is obscured at this point and the end on the ridge observable looking far away. We made good progress over to Sgurr nan Eag with very little scrambling as I knew from a previous trip up the year previously. Once we got to Sgur Dubh an Da Bheinn we left the sacks and headed over to Sgurr Dubh Mor where we did the first real scrambling on the ridge. The weather was hot and the skies blue. We could see the isles of Rum Muick and down to the mainland, however the remanents of the weather front meant most of the mainland was in cloud. 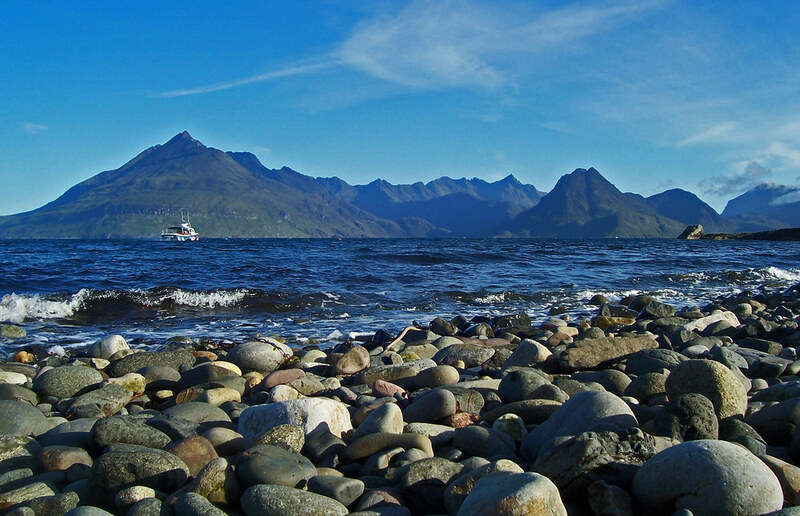 This Monday – Skye was definetly the best place to be in Britain!! We now headed into unchartered territory for me as I had not be north of Sgurr Dubh Mor. Once we had collected the rucksacks we headed down to get some water before tackling the bad step onto Sgurr Alasdair. The scramble up Sgurr Alasdair was fun and we got to the top relatively quickly. The second group were keeping good pace and keeping the distance between us the same, roughly a top apart. Once we were on the top of Sgurr Thearlaich they were on the top of Sgurr Alasdair. For me one of the hardest parts of the ridge was to come between the tops of Thearlaich and Sgurr Mhic Chonnich. The decent was exposed steep and with a section of lava flow which provides loose rock in an exposed part of the ridge – no secure gabbro here!!! Then came Collies ledge which was exposed but not hard, all good exposure for what was to come on the Inn Pinn. We got to the base and one party of walkers was ahead of us. This was around 3.30pm. As we climbed up the Inn Pinn, the other group joined us. This was more exposed than I thought and the breeze certainly pushed past us as we clung on waiting for the party ahead to abseil off. Mike then lowered us down the Inn Pinn. The weather had stayed blistering all day and we were to suffer later on as the temperature got higher and higher. The inteneded bivvy site was only 15 mins away over the top of Sgurr Dearg. The descent to this point was trechourous. I did not like it one bit and found it one of the most dangerous parts of the entire ridge as we had no protection. At this point we were unsure on whether to crack on or stay here. We waited for the second group to join us. Over tea (I disastorously chose super noodles due to light weight = no calories!!) it was decided to push on to the next bivvy site. Had I know what lay between us and the next site I may have thought twice. Thus we packed up from 1st bivvy and with much heavier sacks headed for the second bivvy site (I thought just a couple of peaks away) and was told around 1.5 or 2 hrs away. This was no walking ground though and was exposed hard scrambling, made tougher by fatigue, tiredness and heavier sacks!! First up was Sgurr na Banachdich which is often seen as the mid point of the ridge where it switches from north west to north east. There was exposed scrambling to reach the summit and then across the summit. This would have been very enjoyable scrambling had we been on a day trip, however the thought of one wrong footstep made me concentrate even harder. After this there were the tops of Sgurr Thormaid and Sgurr Ghreadaidh and once again I found the descents far worse than the ascents, trying not to fall on scree or slabs of basalt rock. At this point I thought we were not too far from the bivouc site, however when Mike showed us what we still had to do, I began to think we had bitten off more than we could chew!! 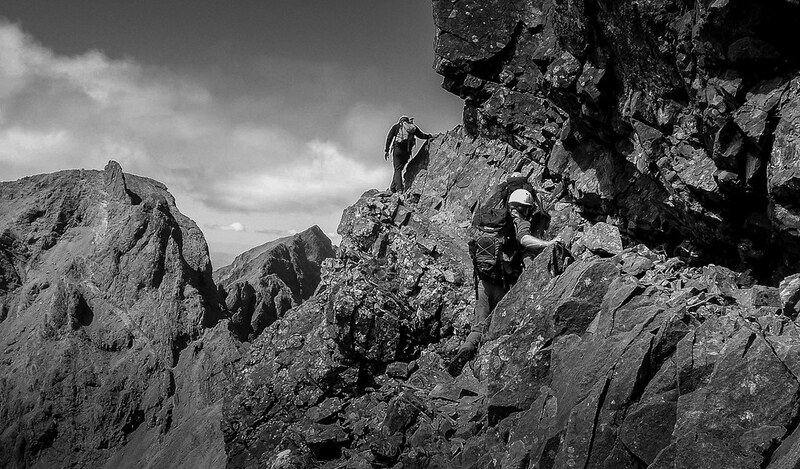 Next up was Maddie – Sgurr a’ Mhadaidh, a smaller set of four tops where we were told there was good scrambling. 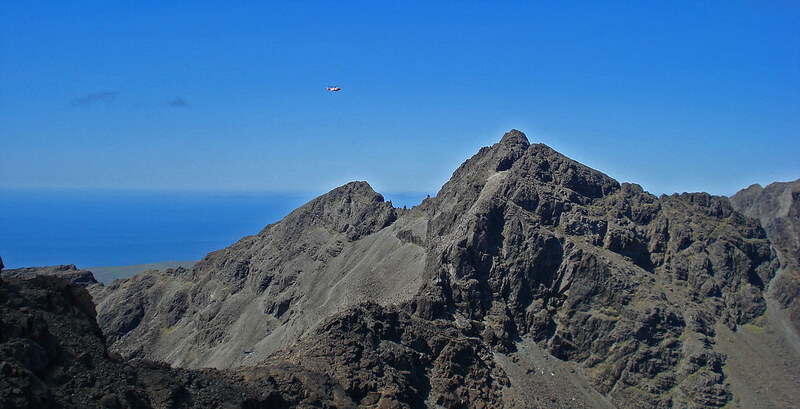 According to some guide books, this part of the ridge provides some of the hardest scrambling with some being described as moderate rock climbing. Many of these tops were ascended by moving to the Coruisk side of the ridge and then climbing narrow, exposed chimneys to gain the tops. At this point I could see someone had disco leg, no wonder considering he had carried the rope the whole length of the traverse. Additionally the heat of the sunny day and the fact that the winds had dropped really affected us. The heat was immense and it was hard to imaging that the previous Saturday whilst on the Loch Treig Munros we were freezingf in snow and hail showers! !I enjoyed this up climbing and with a longer reach perhaps had an advantage here. I would defineltely like to return to do this part of the ridge. Once this was negotiated we descended to our bivvy site on the lowest part of the ridge at Bealach na Glaic Moire. It was now nearly 9.30pm and the sun was beginning to set. Kev had carried 4 beers up on the Saturday and we sat watching the sun set enjoyed a cool carling !! One could make out all the islands to the North and West including the outer Hebrides. This was easily the finest sunset I have ever had the pleasure of witnessing. Just after the sunset, we spotted B team descending the last top, they were 45 min behind and had, had to rope up for much of the climbing from the last bivvy. The bivvy site was set up and I found it hard to initially sleep even given the efforts of the day. I remembering waking and the sky to the west was still red, however a few stars were out. Eventually I woke to hear talking at breakfast. It was 5.30 and time to surface for the home leg. We struck camp quickly and to my cost later I only had a banana and oat bar, however I felt fine. The first peak to cross was the smaller, but technically difficult 3 peaks of Bidein Druim nan Ramh. Once the first peak was reach we abseiled down and then scrambled to the next top which also required an abseil off. The top of the second peak was fantastically airy with a steep drop to the left and a roof like drop to 2000feet on the right. Sitting on this roof at 8 oclock in the morning was beautiful with the views to the now clear mainland breathtaking, overlooking Balven. The winds had shifted to an easterly and we could already tell the temperature would surpass yesterdays heat. However every time we gained the ridge the easterly breeze was very welcome. The descent off the last peak was a roped down climb where I had to lead. There was a tricky step near the bottom, however we all managed well. The ascent of Am Basteir was ok with one bad step requiring the rope. The summit was reached easily. We were back in the coll and to our sack in no time at all to ascent Sgurr nan Gillean, the finest ascent of the entire ridge. We got our sacks and started the slog to Sligachan. We stopped at a pool near the footbridge over the Allt Dearg Beag for 45 minutes to sooth our feet in the crystal clear waters. This was fine indeend. A further 20 minutes later we were enjoying a shandy in the Slig. 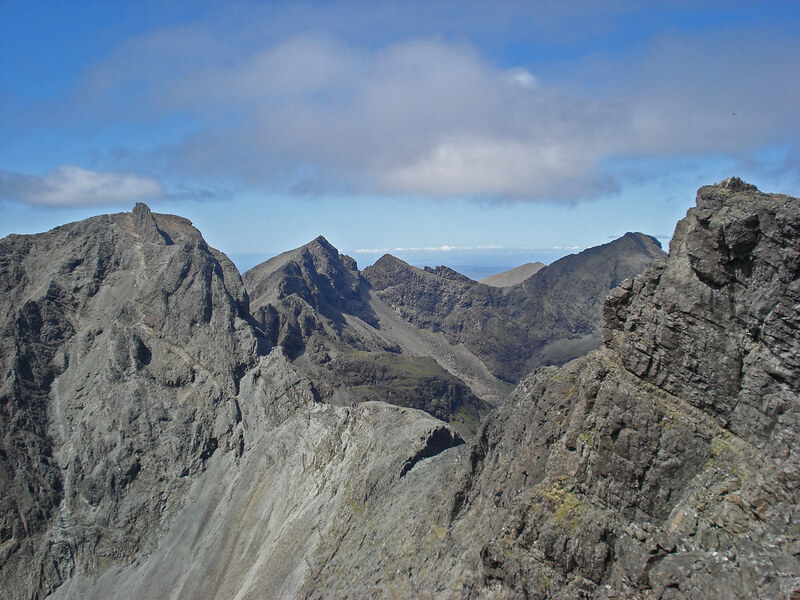 We had completed the famous Cuillin Rige. 2 hours later the B team joined in the celebrations!! !